Yes. Look at rendezvous checklist for example. 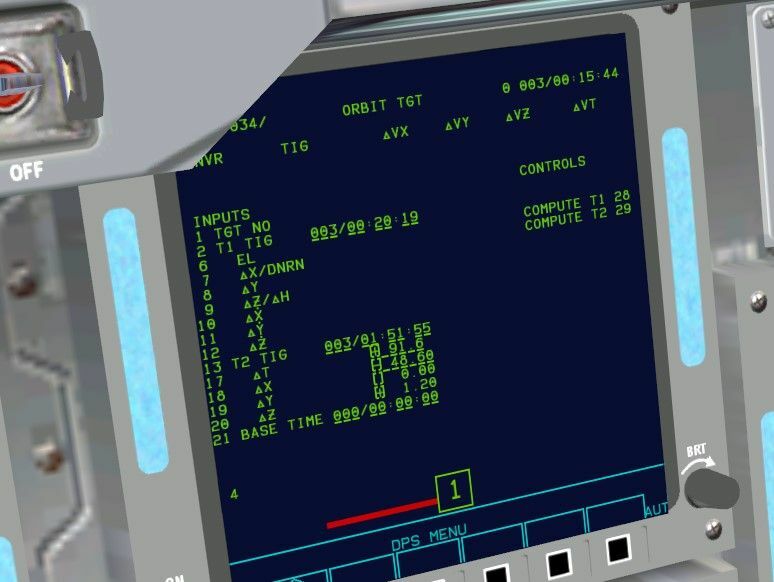 Well, this is a general rendezvous planner, based on the Orbital Maneuver Processor (OMP, hence the name I chose for the MFD) that the Shuttle FDOs used (and definitely a descendant of tools used during Gemini/Apollo/Skylab/ASTP). The picture shows the the Maneuver Constraints Table to the left and the Maneuver Evaluation Table to the right. And I can already use the workflow in the FDO Console Handbook to fix TI lighting and reduce the TI DVZ component by adjusting the TIGs of previous maneuvers. I bet the Shuttle computer supported PEG-7 DV uplinks, but that's just based on the fact that the AGC supported that. So why shouldn't the Shuttle? I can implement the same thing I did for NASSP with my RTCC MFD, in this case select one of the maneuvers from the evaluation table, which are all impulsive burns, calculate a finite burn from it (earlier TIG, modified DV vector) and present it as a Maneuver PAD of sorts. I am recycling a lot from the RTCC MFD, so it's not that much work. When I get this MFD into a more releasable state I'll put it on Github. 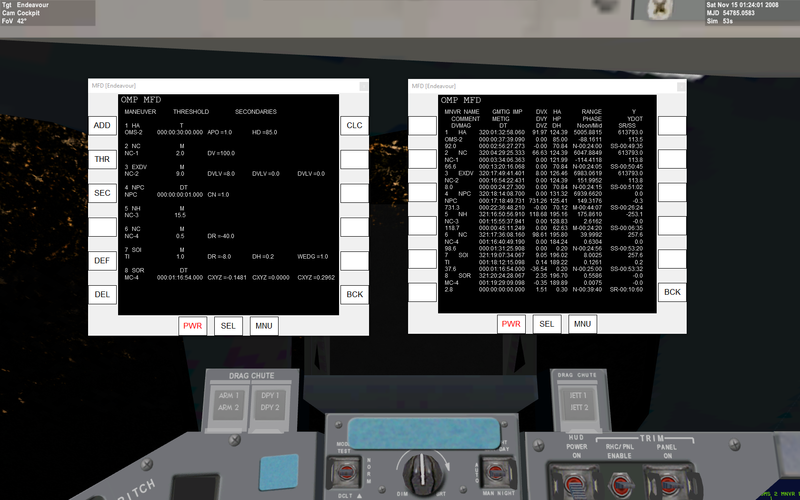 Right now I'm testing a STS-126 rendezvous, just to see if the Shuttle actually ends up somewhere useful. Also, have you noticed the NPC DV vector? 731 ft/s. That is without taking nonspherical gravity into account, with it taken into account it's even worse. Not quite sure why that is. STS-126 launched in the middle of their launch window, so the in-plane insertion that SSU currently supports shouldn't be so bad. Maybe the ISS state vector in the STS-126 scenario is off. As you know the Earth is a sphere in Orbiter, so that puts the launch pad at the wrong place in relation to the ISS plane, so that is one thing wrong. About the ISS state vector, I'm not sure if it is correct... going to celestrack and getting the TLE would be a good idea. Another issue is the time... I think Orbiter doesn't use the "normal" time (whatever that might be ), so that's another factor to account for, both in the scenario/launch time, as well as in the ISS TLE conversion. Ground-up HST rendezvous is even worst because the launch pad is never co-planner with the HST orbit. The worse effect on my software development is not touching any caffeine for the past 8 months. Hey guys, I was wondering how hard it would be to feed some missing parameters in spec 34 ( item 7 to 12 ) to have our relative position at T1 ignition. I had looked for that in the past, pretty sure it's the routine REL_COMP from this document: https://ntrs.nasa.gov/archive/nasa/c...9790001906.pdf PDF pages 46-49. That just needs to be implemented. Still working entry stuff, so I can only look at that when I'm done. indy91, that document looks like a "gold mine", only after a quick look at it, thanks! Thanks for the return . One question: Could this maybe be an option for adding mission control functions to SSU? It is also already supported by KSP via a plugin, so it could well be suited for general Orbiter and SSU, I would say.